At Custom Flavors, we’ve always recognized that customer service is key to our success. This naturally extends to the certifications we carry. Our team has an efficient system in place to get you the documentation you need quickly. Additionally, we carry more certifications than many of our competitors and provide other assurances that are important to your customers. 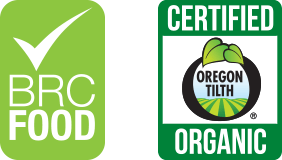 Our regulatory team is capable of completing all the documentation required by your organic certifying agency for using our natural, organic compliant flavors in your product. Natural flavors are made with all natural ingredients as defined by the Code of Federal Regulations, 21 CFR 101.22(a)(3). Natural and artificial flavors contain a natural ingredient from the named flavor and also synthetically derived components. We can provide support through flavor ingredient data sheets as required for your TTB formulas with alcoholic beverages. Increasing numbers of people are requesting gluten-free products. We offer a wide variety of gluten-free flavors. Flavors which do not use genetically modified processes or inputs. Our regulatory team is capable of completing all documents required by your non-GMO certifying agency.